If you own the Assassin’s Creed®3 Season Pass, DO NOT purchase this content here as you will be charged again. Assassin’s Creed®3 game required; sold separately. Xbox LIVE free membership required. 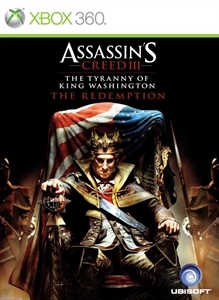 The Redemption is the 3rd and final climactic episode of the Tyranny of King Washington series, in which George Washington goes mad with power and rules as a tyrannical King. In this final showdown, use your newest skills and abilities to take down King Washington, and win the fight for freedom. Live history as it never happened and ignite a new revolution!